A new educational agreement between Wright-Patterson Air Force Base and Sinclair Community College will leverage resources at both institutions to provide firefighter training and offer classroom courses and training opportunities to Air Force personnel. 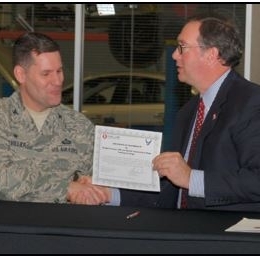 This initiative, signed on January 22 by Col. John M. Devillier and Sinclair President Dr. Steven Johnson, was created out of a push from the Air Force for Public-Public; Public-Private (P-4) collaborations and will be the first of its kind to focus on shared training for base employees. At a time when budget cuts are putting a strain on training and development resources, the partnership provides a unique opportunity for efficiency between two of the region’s largest institutions. The partnership will allow Sinclair access to the base’s fire training grounds, equipment and personnel to assist in developing necessary program enhancements and training opportunities for students seeking first-responder certifications. In the past five years, Sinclair has graduated more than 2,000 first responders, including 531 firefighters in the fire science certification program. In return, Sinclair will provide professional development training to base employees as well as an emergency response certification to base fire department personnel. Visit ABC22 to view video of the press conference.